Since its first publication in 1995, Lies My Teacher Told Me has gone on to win an American Book Award, the Oliver Cromwell Cox Award for Distinguished Anti-Racist Scholarship, and to sell over half a million copies in its various editions. What started out as a survey of the twelve leading American history textbooks has ended up being what the San Francisco Chronicle calls "an extremely convincing plea for truth in education." In Lies My Teacher Told Me, James W. Loewen brings history alive in all its complexity and ambiguity. 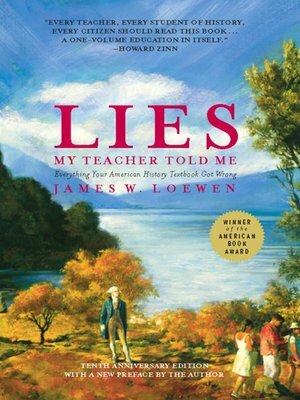 Beginning with pre-Columbian history and ranging over characters and events as diverse as Reconstruction, Helen Keller, the first Thanksgiving, and the Mai Lai massacre, Loewen offers an eye-opening critique of existing textbooks, and a wonderful retelling of American history as it should—and could—be taught to American students. This 10th anniversary edition features a handsome new cover and a new introduction by the author.